Where do you get your water? From the River Himself or from something this world has to offer? The lady Jesus was talking to knew all too well (no pun intended) what the world had to offer – she had drunk deeply from it and often. She was reminded of her sexual sin and shame daily as she came to that well at the most inconvenient and most uncomfortable time of day. She came at the hottest time of day to draw water because all the other ladies in town came at the cool part of the day and she was going to avoid them – and their looks, comments, snide remarks… no matter what it took. Coming to this well was a daily reminder of her shame – and her sin. She was sick and tired – probably more tired than sick – of the reminder. Can you hear the desperation in her voice as she pleads with Jesus to give her the water He was offering? Oh how wonderful it would be if she no longer had to come to that well at the hot part of the day and be reminded of the mess she had made of her life. She would no longer have to avoid the taunts of the other ladies in town. She would be free. Jesus had something else in mind though. He didn’t want to free her in her sin, but to free her from her sin. After she drank His Living Water, what she use to try so hard to hide she now proclaimed from the streets to everyone… “Come and see a man who told me everything I ever did.” Shame was no longer part of her life. That’s what happens when we drink from His water. Our sin no longer brings us shame, but shows His glory. My past sin is deep too, but my Savior’s arm is long and mighty. Do you know what I love most about this story in scripture – after she drank the Living Water the scripture says, “Then, leaving her water jar…” She had no need for that jar any more – precious, just precious! Grady is out of town tonight and I am painting my heart out. He’s at a men’s bible study retreat. He loves weekends like this – deep in the Word. I am so thankful for him and love him so much. 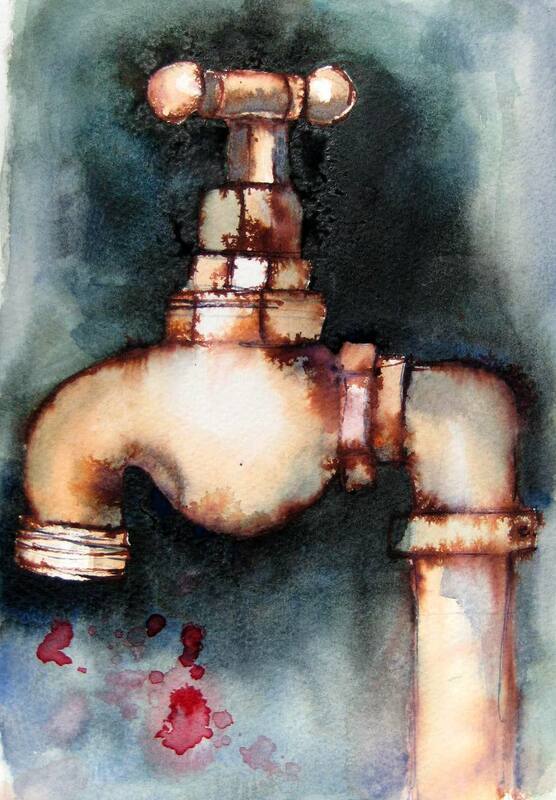 I painted this water spout today from an art video painting lesson. As I was painting it I was thinking of the scripture I wanted to put with it and just couldn’t get this story of the woman at the well off my mind. I love that story. I love my Savior – He is mighty to save!